constituents : Sodium chloride, water for injections. cytomegalovirus infection in patients subjected to immunosuppressive therapy, particularly in transplant recipients. Contra-Indications: Megalotect® is contra-indicated in patients who are intolerant to human immunoglobulin especially in very rare cases of IgA deficiency, when the patient has antibodies against IgA. Pregnancy and lactation : The safety of this medicinal product for use in human pregnancy has not been established in controlled clinical trials and therefore should only be given with caution to pregnant women and breast-feeding mothers. Long lasting clinical experience with immunoglobulins does indicate that no harmful effects on the course of pregnancy, on the foetus and the neonate are to be expected. Special precautions for use: Certain severe adverse drug reactions may be related to the rate of infusion. The recommended infusion rate given under "Method of administration" must be closely followed and patients must be closely monitored and carefully observed for any symptoms throughout the infusion period. Patients should be observed for at least 20 minutes after administration. Effects on ability to drive and use machines: There are no indications that Megalotect® may impair the ability to drive and use machines. Dosage instructions and duration of application: As a rule doses containing 50 units (PEI) Per Kg Body Weight, Which Corresponds To 1 ml, should be administered. Administration should be initiated on the day of transplantation or the day prior to this (bone marrow transplantation). A total of at least 6 doses at 2 to 3 weeks' intervals should be given. Interactions with other medicinal products: Live attenuated virus vaccines: immunoglobulin administration may impair for a period of at least 6 weeks and up to 3 months the efficacy of live attenuated virus vaccines such as measles, rubella, mumps, and varicella. After injection of immunoglobulins the transitory rise of the various passively transferred antibodies in the patient's blood may result in misleading positive results in serological testing. Method of administration: Megalotect® is intended for intravenous use. During the infusion, the rate of 20 drops per minute(corresponding to 1 ml per minute) must not be exceeded. Megalotect should be inspected visually for particulate matter and discoloration prior to administration. Do not use solutions which are cloudy or which have deposits. Megalotect should be brought to room or body temperature before administration. Special precautions for storage: Megalotect® has to be stored at + 2ºC TO +8 ºC Protected From Light. Do not freeze. Megalotect should not be used after the expiry date indicated on the label. Any unused solution must be discarded because of bacterial contamination risk. Presentations: Ampoules with 5 ml, 10 ml and 20 ml, infusion bottle with 50 ml. For additional information see package insert. 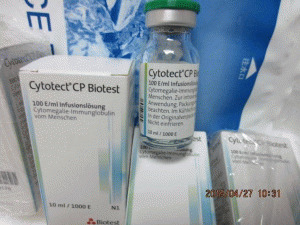 上一篇：Cytotect CP Biotest 5000IU/50ml.. 下一篇：Synagis 50mg Injektionslös..